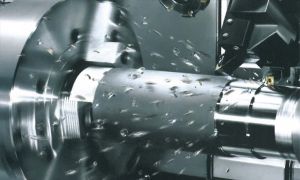 Designed for large-diameter, long-shaft workpieces, the CYBERTECH TURN machines pack the rigidity and horsepower for heavy-duty cutting with Multi-Tasking capabilities for aggressive metal removal. The machines allow for turning, milling, drilling, tapping and deep boring up to 40″ in a single machine setup. As ergonomically designed machines, tools are highly visible, and setups and programing are easy. An optional pipe re-threading program calculates positions and performs re-threading in a few simple steps. The powerful main spindle is designed for heavy-duty cutting and features an integral variable-speed AC inverter motor with two gear ranges to realize high spindle speed and high cutting torque. 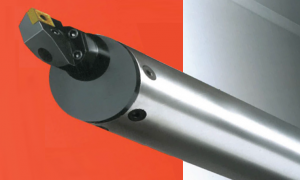 For high accuracy contour machining, the C-Axis is driven by a drop worm system and has a minimum program increment of 0.001 degrees. 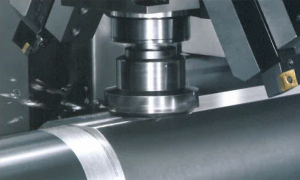 The main spindle bore features generous standard sizes as large as ∅375mm (∅14.8″) with 500RPM, all the way down to ∅132mm(∅5.2″) at 2400RPM. In addition to threading, the manufacturing of oil piping also requires drilling, tapping, and groove machining. 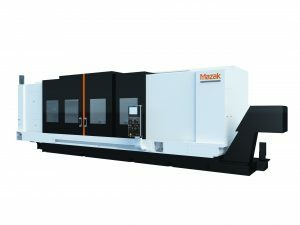 The powerful milling spindle with an output of AC11 kW (15HP) and top-speed of 3000RPM has the same machining capability of a mid-size machining center. Two long boring bars can be stored in the long boring bar stocker located above the tailstock. This provides a particularly useful feature that allows the deep boring processes of large workpieces to be performed automatically while avoiding the sacrifice of rigidity everywhere possible.